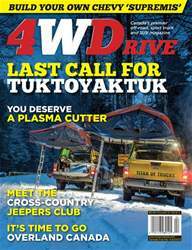 In this issue of 4WD we review the Mickey Thompson Deegan 38 A/T tires, the Rampage TrailView Soft Top for Wrangler JKU, and get an informal opinion of the Miller Spectrum 625 Xtreme Plasma Cutter. 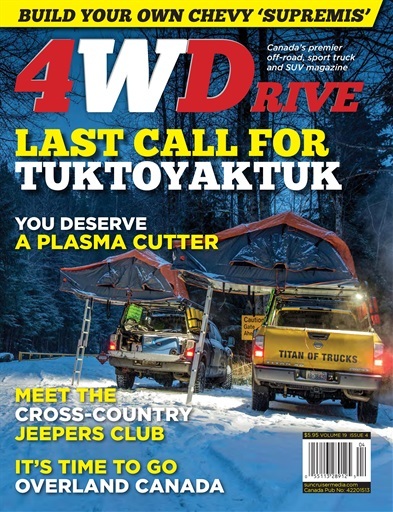 In our feature article “Last Call for Tuktoyaktuk”, we follow the Titan Arctic Challenge expedition on the final season of the Tuk ice road over the Arctic Ocean. And, in a befitting column, 4x4 coach Tom Severin highlights the importance of “Wilderness First Aid Training”. Another travel feature “It’s Time to go Overland Canada”, gives great advice on how to have a successful and enjoyable overland experience. In “Addicted to Dirt”, Editor Irons gets started on adding the beef to a basic 2015 JKU Sahara, for better off-road capability. Next step – the bling, watch for it. All this and more, including our New Product Showcase and Club News.